I have a soft spot in my heart for Fargreen. The startup that emerged from the Colorado State University Global Social and Sustainable Enterprise MBA program (full disclosure, Colorado State is my employer and I served for many years on the advisory board for this program). I also know Fargreen’s founder, Trang Tran. She developed a great idea to help Vietnamese farmers while also lowering carbon emissions. What is not to like? After winning several business plan competitions, Trang is now moving her business forward. This brandchannel article “Yale on Purpose-Driven Startups: Fargreen — Going Far By Going Green” (May 2, 2016) is one in a series with Yale MBA students. Read the article about Fargreen. Explain how Fargreen ties into macromarketing, micromarketing, and innovative marketing planning — all major topics in chapter 19. Filed Under: Chapter 19, Marketing strategy planning, Social responsibility, Sustainability, What's Now? The website brandchannel has launched a series of short case study articles. A team of Yale MBA students evaluate a purpose-driven startup and offer some marketing strategy recommendations. In “Hugo & Hoby – Quality, Sustainably Sourced Furniture,” (April 27, 2016) you learn about a startup furniture maker that needs to move from making sustainably sourced furniture for friends and family to a wider market. Read this article and review the recommendations made by the team of Yale MBA students. What concepts from chapter 1 do you see demonstrated in this case study? Can you think of any other ideas for improving Hugo & Hoby’s marketing? Filed Under: Chapter 01, Social responsibility, Sustainability, What's Now? Some technological and social cultural trends are beginning to have an impact on how Americans drive. Think about smartphone based services like Uber and Zipcar — which may make car ownership much less necessary. Google’s self-driving car is on the horizon. And people are more and more interested in city living. This Fortune article “The end of driving (as we know it)” (June 12, 2014) highlights these trends. What industries could see these trends as threats? What industries might see these trends as an opportunity? What new goods or services might leverage these opportunities? Encourage your students to move beyond the immediately obvious examples — automobile manufacturers — and encourage them to consider other industries (say hospital emergency rooms that do a lot of business from automobile accidents — which should decline significantly with self-driving cars). These questions are designed to help them recognize and anticipate change. You might use this when you cover the external market environment, demographics, consumer behavior, or marketing strategy planning. This article “Vast underground bomb shelter reappropriated by urban farmers” (Wired.com, February 11, 2014), describes an innovative new “farm” located 100 feet below ground in southwest London. Zero Carbon Food uses a World War II bomb shelter designed to hold 8000 people. Fortunately it has not been needed since WWII and it has laid dormant — until now that is. A couple of entrepreneurs are growing broccoli, pak choi, and more using hydroponic growing techniques. One of the benefits — low shipping costs (something to talk about when you cover logistics) — and certainly appeals to the environmentally conscious segment of the market. We thought that our students would also find this interesting, so this was also posted at Learn the 4 Ps. Most marketing managers look for ways to get us to use more of their products. On the other hand, many power companies have programs designed to help consumers become more efficient users of energy — to use less electricity, gas, etc. This is good for consumer budgets, better for the planet — and with some regulatory incentives, it can be better for utility companies as well. Utility companies are learning something from academics (for one example, see T4Ps blog post “Figuring Out How to Nudge Consumers to Make More Sustainable Choices“). This recent Wall Street Journal article, “The Efficiency of Social Pressure” (September 5, 2013, non-subscribers may need to click here) describes utilities hiring behavioral scientists to learn how to encourage customers to be more prudent energy consumers. 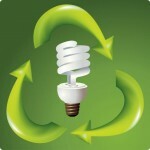 The article notes the inefficient use of energy in the residential sector. This might be a good example to use when you cover social responsibility or consumer behavior. Your students might be able to generate more ideas about how to encourage environmentally friendly consumer behavior. We have also posted this at Learn the 4 Ps.